I’ve seen a few things on how great Samuel Fuller is, and I’ve not really watched or read any of his stuff before. Hope to read some of his noir fiction soon. I got a hold of this movie first and gave it a viewing. Fuller wrote some of the dialog for this film and directed it. This is actually a remake of the film noir The Street with No Name. I have not seen Street with No Name but may have to check it out and compare it to this one. Fuller filmed this film noir in CinemaScope and color, not many film noirs from the classic era where done this way. 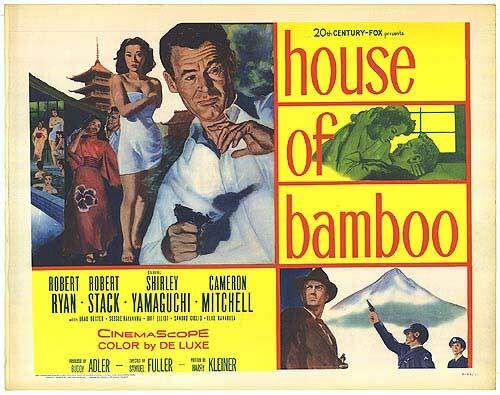 This has 2 noir greats in it, Robert Ryan(quickly moving into my 5 favorite noir actors list) and Robert Stack. We also have a fairly unique setting, this film was filmed and takes place in Tokyo. We also have some Japanese talent in this film most notably is Shirley Yamaguchi as a kimono girl and Sessue Hayakawa as a police inspector. Our story starts out with a train heist, a group of masked men rob the train which is protected by the U.S. Military as well as the Japanese. They kill an Army soldier bringing in the military police to investigate. Three weeks later we have another robbery, this time a man is shot by police and then shot 3 more times by his own team! This is to make sure he is dead and can not get caught and talk. The problem is he didn’t die! They take the 3 slugs out of him and they match the bullets to the one in our dead soldier. Even though his cohorts shot him, our suspect will not talk before he does die. They find a picture of his wife(Yamaguchi), they keep it secret so his fellow criminals do not know about her. They also found a letter from his friend Eddie who he tells to come to Tokyo for a cut of their new job. Soon Eddie comes to town(Stack) and finds his friends wife. He then falls into a crew of Americans pulling heists, run by tough guy Sandy(Ryan). The story twists and turns from there for an enjoyable film. This was an interesting movie with some great shots and scenes, very unique being in Japan and filmed in color. I will definitely be looking for more stuff from Fuller to watch. This is for any fan of film noir that does not mind it being in color, as well as fans of Fuller, Ryan and Stack. Favorite Tidbit: According to Robert Stack, in one scene Fuller told an actor to duck really low by a 50 gallon drum as he passed. The actor was shocked when a real bullet went by him into the barrel. Fuller used a sharp shooter for the scene and when the actor complained, Fuller told him the shooter know what he was doing. This is a great color Noir. Ryan is dangerous as always. The Cameron Mitchell character really adds to the whole plot line as well. Solid and glad you mentioned the camera angles as they are noticeable due to the fact that for the era they are ahead of their time. Ryan has really grown on me that last few movies, I look forward to watch more stuff with him in it. Quite a few to catch up on then. On Dangerous Ground, The Set Up and The Racket to name a few. Have fun!